Joe DeGuardia’s Star Boxing’s “Rockin’ Fights” 32 is already set to be a barnburner with a hometown, main event showdown, between two of The Paramount’s finest in, DANNY “EL GALLO” GONZALEZ (Woodhaven, NY 16-1-1 6KO’s) and JOHNNY “HITMAN” HERNANDEZ (Huntington, NY 9-3 1KO). With a combined 20 appearances at The Paramount, both Gonzalez and Hernandez are determined to leave with the ABO INTERCONTINENTAL TITLE on September 21st. 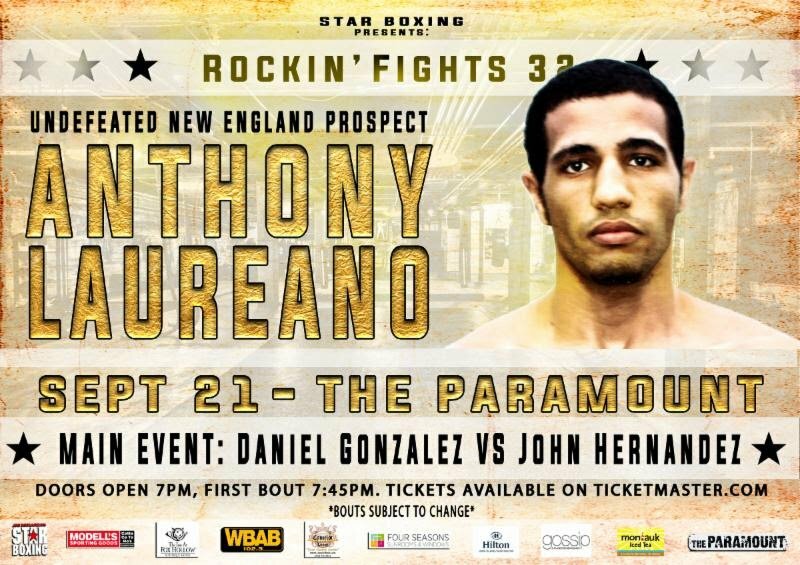 Star Boxing now announces the addition of top rated undefeated New England prospect, “ACTION” ANTHONY LAUREANO (East Hartford, CT 8-0 3KO’s) to the already exciting show. Laureano has been making a name for himself over the past year, earning honors such as the 2017 New England Prospect of the Year and also Star Boxing’s Prospect of the Year. Most recently, Laureano defeated Juan Rodriguez at Mohegan Sun Arena in dominating fashion, winning by unanimous decision. Laureano controlled the action from start to finish with his relentless and exciting style, showing rough, ‘old-school’ fighting on the inside, and cutting off the ring. In April, Laureano traveled to Massachusetts to take on up-and-coming prospect Tobias Green of Florida. Laureano and Green went toe-to-toe over six rounds, where Laureano allowed his persistent fighting style to shine, as he dug in and earned the victory, in a terrific fight. Anthony returns to the Paramount on September 21st for the second time in his career, the last almost exactly a year ago, when he defeated James Lester at “Rockin’ Fights 28”. After dictating the fight from the opening bell, and planting Lester on the canvas with a vicious right hand, Lester’s corner called off the fight, as Laureano earned the TKO win. GET YOUR TICKETS TO ROCKIN’ FIGHTS 32 TODAY! Rockin’ Fights 32 on September 21st pits two local warriors in, DANNY “EL GALLO” GONZALEZ fighting at The Paramount for the ninth time, against, JOHNNY “THE HITMAN” HERNANDEZ who will be in his first main event and eleventh bout at The Paramount, for the ABO Intercontinental Title.